The treating of patients has taken a back stage to the training program–I have not been too present to take photos as I am always involved in the training program. We have also noticed that our patient load is lighter than past missions. We were puzzling over this until we started getting reports from the bush that because of the presence of the clinic all the time, we have improved the general health in the region and the need for care during the missions has gone down–I guess the ultimate goal is to make ourselves unnecessary. I think we have taken a step in this direction. Even though we have a higher level of experience when we bring in American doctors, we know that the clinic can operate on its own and can take big strides in improving general health in the region. We are pretty proud of that. 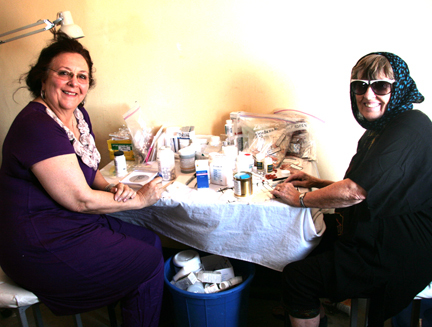 Louine runs the pharmacy with the help of Linda–both have worked really hard, not only filling perscriptions and fitting glasses, but preparing the medicine to replenish the matrone’s supplies to take back to the camp. 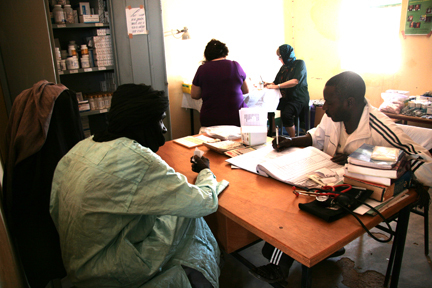 Ali checking in patients with the medicine chest and pharmacy in the background. Sidi with our friend Tambola’s mother who is being treated for malaria. Her son travels alot in the modern sense, runs a travel agency and lives mostly in Niamey. 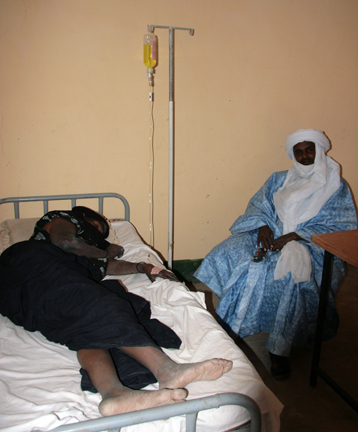 Yesterday we treated the mother of another Tuareg friend who lives in Tucson and Mexico. No matter where a Tuareg ends up he usually has family here in the homeland in the bush where the true nomads live: the pasturelands of the Cure Saleé: Tamesna.